According to Qurans description, the same rule implied to humans, but a man gets in the bosom of death when he sleeps, and he surrenders his soul to god or angel of death. At this time, there is only a narrow bond between soul and body, and if it is cut, then the death shall be complete and the soul shall not return to body. Thus according to Quran every human being experiences the death by every sleep and returns again, to observe an example of resurrection. 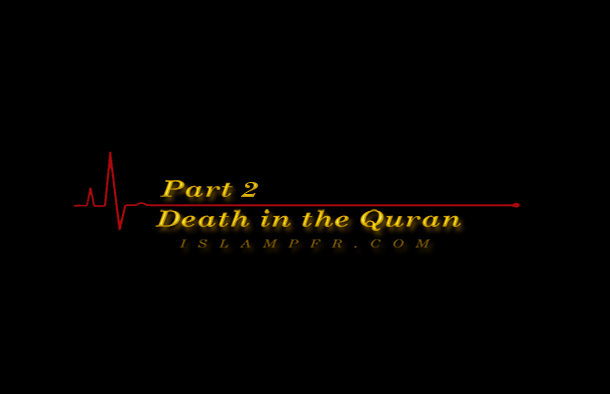 Death in Quran, means to be transferred from one position to another. It means that men lose nothing by their death, and what he gains by this process is worth what he puts behind. It is like the transformation which a moth endures. A silkworm on a tree, then a cocoon, and eventually it becomes a moth who can fly, and a little before it had nor the beauty nor the powers of a moth to fly. Every sequence of life and death of the human beings in the womb, this world, Barzakh and the other world is the same. With a difference that, a moth follows this path naturally, but man follows this path depending on his efforts and by showing his capacities and talents. As much as he realizes more of his talents, he shall gain more in the afterlife. Although all creatures are moving toward the lord and shall meet him, but in humans, this movement and transformation depends on their actions. If men, choose a transformation which is ascendant, he shall eventually meet the lord and he shall face him by the name of the merciful and compassionate, but if he chooses the path of descending he meets the lord by the name of avenger and dominant. Anyway man should eventually, face death and experience it. In the opinion of Quran, death in any form is a transformation. Such a transformation is his ultimate fate which shall not be delayed nor hastened. Eventually any human will experience his new life at the time of his death. Sometimes, the death is at once and sometimes it is gradual. What is related as the events before death generally refers to gradual death which is called “Ehtedhar” in Arabic language. “Ehtedhar” is a word which means to be present in Arabic language. It refers to the time before death. Because death comes upon one’s bed as a creature and takes him to another world. The concept of “Ehtedhar” has been noted in Holy Quran, but not in the same expression, instead of which it is called “Stupor of death”(50-19), “the agonies of death”(6-93), “presence of death” (4-18), “arrival of death” (6-61), “when the soul come up to the throat”(56-83), “taking the soul” (16-32) and etc. In the 30th verse of the surat of “Qyamah” the concept of “Ehtedhar” is called “to be driven” because any one is driven to god upon death, which means that this is a compulsory movement. Application of the word “driven” means that any man dislike to go to the lord by death; so he should be driven on the channel of death by force. The angels who are responsible to take the souls (79-1), should take the soul of disbelievers harshly. Men have much interest to this world and they don’t want to leave it, so their soul should be taken by force and he is not willing to easily surrender his soul, abandon to another world and leave his body. The soul comes up to the throat, which is one of the conditions before death. Quran uses such an expression to show the terror of men upon death, as if he is dominated by his enemies and is in a tight position and he can’t go further or back. Holy Quran denotes that the soul comes to Jugulum which is a bone beneath the throat and in the top of chest. Holy Quran refers to the position and condition of men upon death and describes his look which is full of pity and fear. This is while the dying person asks for help by his body and tongue and tries to free himself. Holy Quran denotes that the lord is closer to him than the people who are next to him upon death, to show the disability of men and the power of god. Now he must say goodbye to his possessions, children, life and relatives and leave what he has gathered together and there is separation between them. It is described in the Holy Quran that the angels hit the back and face of the disbelievers and hypocrites (47-27)(8-50). They hit their face to show what is waiting for them in the future and hit their back to show them what they left behind. According to Holy Quran god has given good news to the faithful in this life and the other. (10-64) it is related that their good news in this world is their dreams and their good news in other life, is good news upon death. There shall be no repentance upon death and if there is any hope for any man it is before this time. Thus the repentance of pharaoh is not accepted. (10-90&91) The holy Quran describes in the 18th verse of the Surat of “Nesa” that when the truth of life and death is revealed, the repentance is useless.